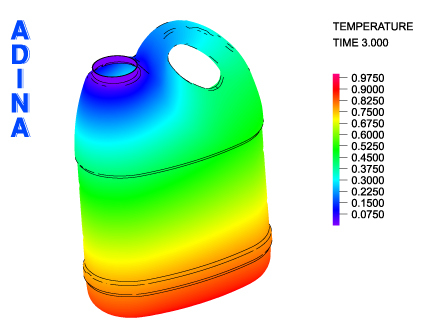 ADINA Thermal is used to simulate heat transfer through solids and structures. It has powerful analysis capabilities such as radiation between surfaces of arbitrary geometries, element birth-death options and capabilities for highly nonlinear material behavior. The ADINA Thermal program is used for the solution of heat transfer problems in solids and structures. It has powerful features such as radiation between surfaces of arbitrary geometries, element birth-death options and capabilities for highly nonlinear material behavior. ADINA Thermal may be used as a standalone program for thermal-only analyses, or it may be used in conjunction with other modules in the ADINA product suite for multiphysics applications, such as thermo-mechanical coupling or thermo-fluid-structure interaction analyses. A unique capability of ADINA Thermal is the analysis of radiation between surfaces. The surfaces can have arbitrary geometries, can be arbitrarily obstructed and radiate upon themselves. The bottle in this figure was analyzed using this radiation capability. Welding-induced residual stress analysis requires a reliable nonlinear analysis system with specialized modeling techniques. 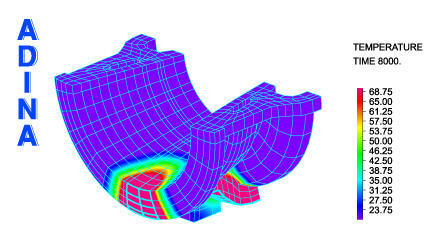 ADINA Thermal and ADINA Structures are used successfully in welding analysis in a thermal-mechanical coupled analysis. The finite element calculation was performed using the birth/death options of the elements, with material properties highly dependent on temperature.